I've been pretty busy until recently but now I finally have more time to make some major progress on the next version of Broken Hymn. Um, hopefully the following things I say won't be to confusing. I was making more custom sprites for the game recently and though you guys might like to know more about how I edit sprites for my games. If it's a major character, first I may create it using 3DCG, afterwards to make a custom rpg maker sprite, I normally start this by using a rpg maker sprite generator(like the one that comes with rpg maker vx ace). 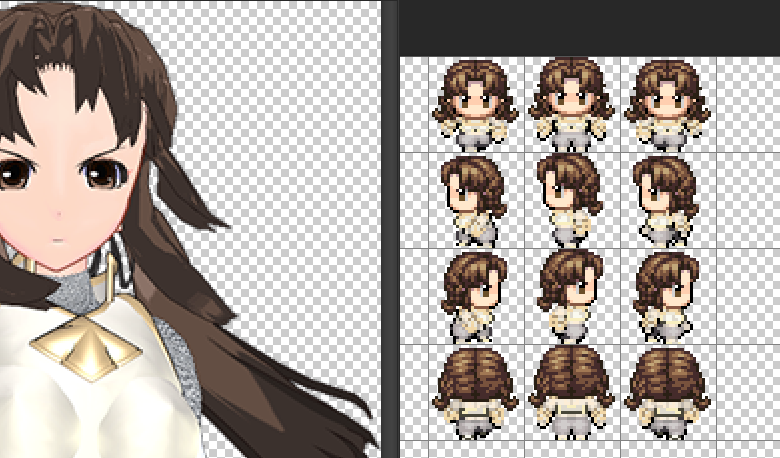 I try to make it look as much as possible like the rpg maker character, like when I made Shouko's sprite. Usually it won't look just like the character, so I edit it more in photoshop. The steps I do in photoshop can variety depending on what I want to do with the sprite, sometimes I may do all the editing at once or other times I will do it over a period of time. I edited Shouko's hair color today, so I thought I would show you'll how I did it. Also, this could basically be used to recolor anything in an rpgmaker sprite. 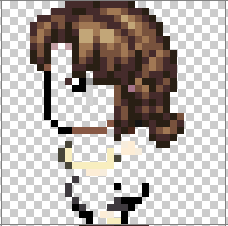 I've edited shouko's sprite before but I've skipped doing some things such as the hair. On the left sprite you see shouko's hair color given using the sprite generator. This is one of the basic hair colors of the generator and it doesn't really match shouko's CG hair color, the difference maybe isn't too major but it can be enhanced more. 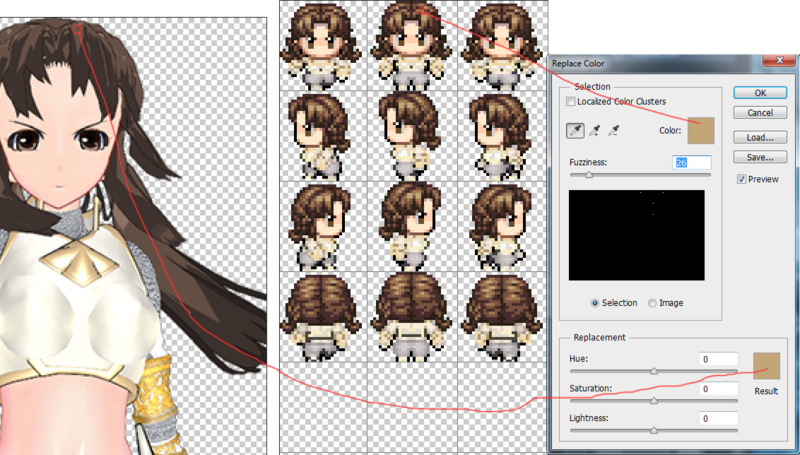 Then I copy(duplicate) the sprite layer to make two of them(now I have one called layer0 and one called layer1 on top). If you don't know much about image editing, basically layers are images stacked on top of one another, each layer can be edit or hidden individually, and when you put them all together they make a complete image. Layers can be used to give you alot more control over the image. 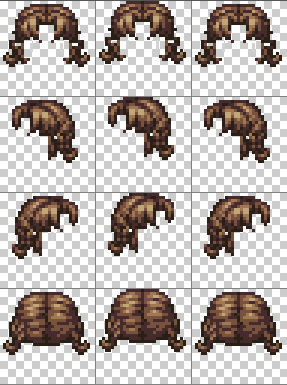 There aren't too many colors in an rpg maker sprite so after a few more clicks, there's nothing left but the hair(note this might require a few more steps if the clothing is the same color as the hair but usually most parts of the sprite are different colors). This is all basically stuff you'll eventually find out as you play the game. I'm not sure how interesting this will be before you actually play it in the game, so i'll try to keep it simple(and this won't go into too much detail). This is just to clear up the story a little bit for those who are confused and want to know now. If you don't want to spoil any of the game, please do not read this. 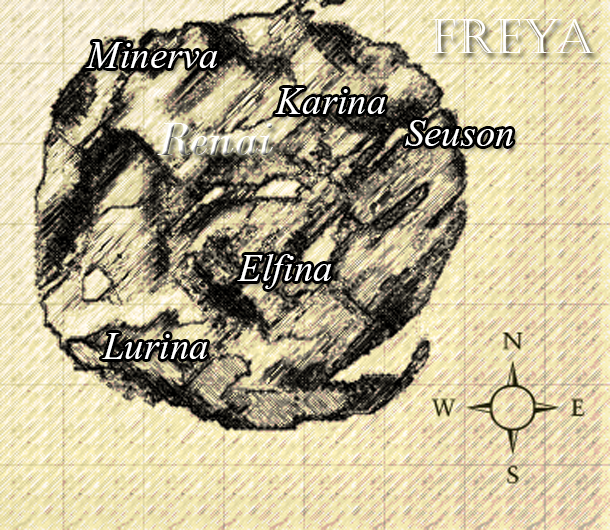 On the continent of Renai there are 5 kingdoms, so far the game has focused on Minerva and Seuson. 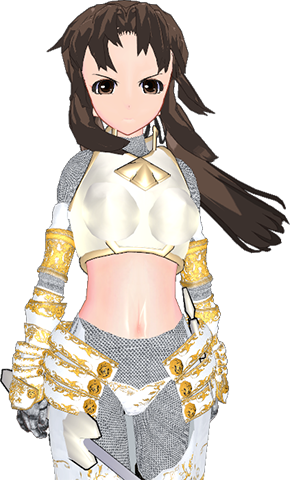 Minerva - Minerva is a kingdom ruled currently by Princess Mina, the childhood friend of Prince Lean, along with the sickly Queen of Minerva. Minerva fought in a war known as the battleline war, near the end of the war Karina joined Minerva to assist them. But by then Minerva lost nearly all of their military and their King to the war. Minerva now has only a few hundred soldiers. Karina - Karina is a kingdom ruled by the king and the princess. The former mercenary Shouko gained the support of the princess after saving the kings life from an assassination. Karina joined the battleline war near the end after being attacked by pirates from the country Elma. After the war ends Karina continues fighting up north leaving little to defend their kingdom. After disturbing news, Shouko leads her band of former mercenaries on a mission to the kingdom of Seuson. However Shouko get no support from the king of Karina, only very limited support from the princess of Karina. Elfina - Elfina is a kingdom once ruled by the kind King Foy, along with Prince Enn and Prince Lean. As the oldest Prince Enn was inhered the Kingdom of Elfina, while Prince Lean was to move to Minerva and marry Princess Mina since the Elfina Queen could no longer have children. Not to long after discovering a gigantic gold mine on the land of Elfina, the Kingdom of Seuson desires their wealth and starts a war with them. The Seuson-Elfina war leads to the death of both king of Seuson and the king of Elfina. Prince Enn goes off to war but what happened to him is unknown. After the capital of Elfina is attacked, Prince Lean, the younger brother of Enn, flees to Minerva where Princess Mina rules. Seuson - Seuson is a kingdom ruled by a queen and a princess. Seuson and Elfina always had an unstable relationship and after Seuson learns about the gold discovered in Elfina they decide to go to war. The king of Seuson dies in the Seuson-Elfina war, however Seuson does not lose this war. Out of the 5 kingdoms Seuson has the most powerful military and they are not known for kindness. This game is something like a dark fantasy, but it's focus isn't kings or kingdoms, it's a dark game and will include a wide variety of sexual fetishes, once the 2nd chapter begins, I think you guys will understand the way this game is alot more.